I never thought I would actually thank my anxiety for being a part of my life. In fact, I used to resist its unwelcomed visits to the point of exhaustion. How could I sit back and allow my uncomfortable feelings to persist without a fight? My anxiety made me feel like a completely different person - a person I didn’t really like, for that matter - so I did everything I could to avoid it at all costs. Keeping myself busy was the name of my game. What better way to avoid your emotions than to make sure you were too busy to feel them? And let me tell you, this strategy worked for a while, until my body decided it had a better idea. The more I continued to resist my feelings, the more anxious I became. So much so that I actually began to worry about worrying, which was not the most productive use of my time. This cycle lasted on and off for the majority of my childhood and into my adult life. 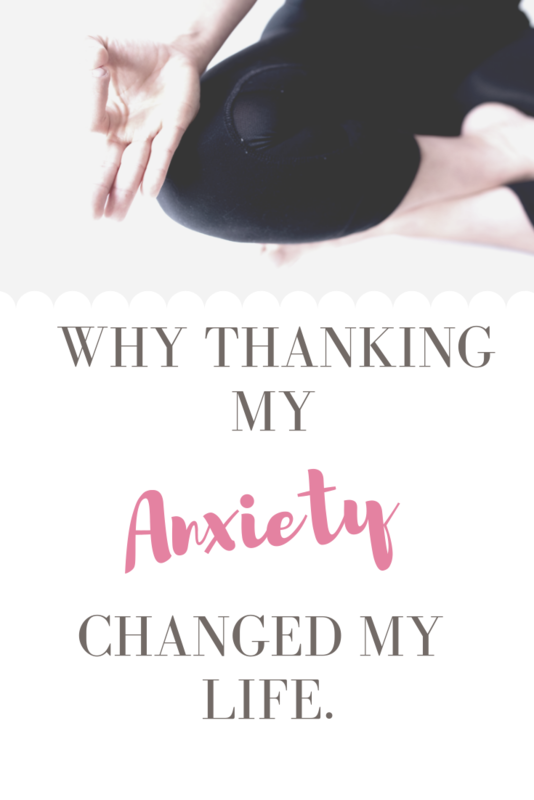 I had decided that anxiety was going to be my reality, and it wasn’t until my mid-20’s, that I realized the power to change that subconscious belief was in my control. Enter my self-help phase! I tried everything that was humanly possible to “fix” myself. I experimented with various diets, started a yoga practice, meditated, and scheduled acupuncture. I was on a mission to fix what was “wrong” with me and nothing was going to stand in my way. But even though these new practices were easing my symptoms, I still had this sinking feeling in the pit of my stomach that something was missing. Here I was trying to fix my body, while simultaneously still fearing what it was capable of. Sure, I was dealing with the symptoms, but I wasn’t actually healing the root cause as to why they were there in the first place. what if the need to fix myself was actually at the root of all my fears? What if I didn’t need to change who I was at all, and rather, could begin to love and accept the person I already AM. “Perhaps this whole anxiety thing is in my life for a reason,” I started to wonder. Not to torture me, but to teach me how to come home to myself. It was this new change in my perspective that began to shift my journey towards healing. If you would have talked to me a year ago I would have told you just how much I hated living with anxiety (seriously, ask my therapist …). There would have been no way you were getting me to see this inconvenience from a positive place. But after living with one mindset for so many years, what did I have to lose by changing it? So, I practiced flipping the switch and reprogramming my thoughts. I practiced again, and again, and again. And you know what? Eventually, it started to work. We so often go to our doctors with a host of problems that we want fixed. We talk down to ourselves because we aren’t “perfect enough” or “as put together as her...” and we go through our lives believing that there is constantly something we must improve upon. But what if it was ok to be just as we are? What if having fears and being sensitive was actually a gift and not something to be ashamed of? I sat with these words for a moment and really let them sink in. For the first in what felt like forever, I felt a release of tension and ease wash over my body. How lucky was I to have experienced the darkness in order to truly appreciate all of the beauty in my life. How lucky was I that my anxiety pushed me to really listen and respond to what my mind and body was calling me to do. I was lucky to be me, and in that moment, everything seemed to make sense. Anxiety is still a part of my story, but it doesn’t define who I am. Rather, it has shaped me and helped me become the person I was put on this earth to be. It has made me empathic and sensitive in all the most wonderful ways. It has allowed me to connect in my career as a teacher and health coach. Most importantly, it has given me the gift of truly feeling. The gift of feeling, and loving, being unapologetically me.